While looking for craft ideas for the kids and I to make this Christmas, I happened to come across some of the most beautiful craft ideas. So this year I have decided to do my own 25 Days of Christmas version. If only to serve as a place where I can come back to and check out the ideas I have saved. Day 1. 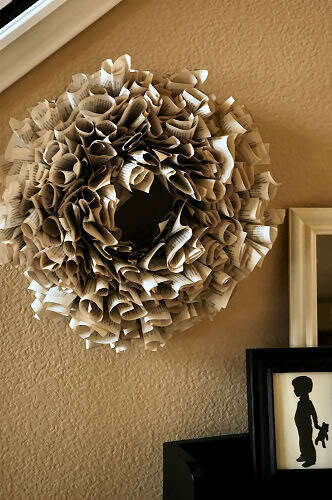 The most beautiful wreath I have seen. I have my book and styrofoam ready to go. I just need to finish off a class sample first so I can get stuck into creating this gorgeous wreath for my front door. Photo credit to Lindsay from Living with Lindsay. Here is the link to her site and how to make this stunning piece.